Includes Skipper and Crew, fuel for the suggested trip in our Brochure, and Tea or Coffee on board. 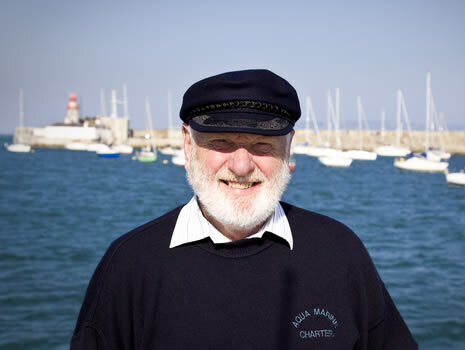 Includes Skipper and Crew, fuel for trip around Dublin Bay and a visit to The Port of Dublin. For short trip or special requirements. How Many Can The Beluga Carrry? A Maximum of 12 Persons plus Crew can be carried on the Beluga giving extra comfort to your clients or friends. Should you have a group of more than 12 people extra boats can be hired. Beluga has been passed by the department of marine to carry 12 passengers. All safety equipment has been inspected and is in date. 'Beluga' is based in Dublin and is now operating from the Dun Laoghaire Marina, servicing the East coast of Ireland. Have you ever considered taking to the sea to entertain your clients or friends? Imagine a boat trip through Dalkey Sound, viewing the old Martello Tower and Battery on Dalkey Island and cruising on into Killiney Bay, locally known as 'The Bay of Naples', turning to port and heading towards the Kish Lighthouse, then onward past beautiful Lambay Island and calling at Malahide or Howth Village. There are a number of other journeys around Dublin that you can avail of. Lunch or Dinner can be arranged ashore at Malahide or Howth village, where there is a good Seafood restaurant. We can of course cater for your individual needs and work with you to ensure that the schedule meets your requirements. Go on charter 'Beluga' to be a part of the fun. 'Beluga', is a 43 foot luxury cruiser, fitted with twin 375 hp caterpillar engines giving a maximum speed of 15 knots.